The ZLM1 and ZLM4 are low voltage 1 -and 4-zone electric fence energisers. The unit pulses and operates like a normal electric fence energiser, except that the voltages are under 50 V, making it intrinsically safe and below any perceived ‘dangerous high voltages’. This energiser has been a huge success as installers faced with sites under the new SANS electric fencing act, that were deemed dangerous as high voltage wires were exposed to public access areas, now have a solution. The installers were previously faced with either removing the fence or installing an expensive barrier fence. With the ZLM monitors, fence sections below 1.5 m could be wired into the JVA monitor and still be fully monitored and alarmed without any dangerous shocks. The product has been very successful with many housing estates, industrial companies and old age homes. 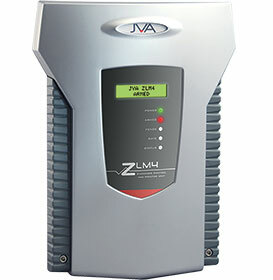 Even some government organisations have replaced certain energizers in their systems with JVA ZLM units to achieve their COC compliance. With its TCP/IP interface and networkability, the ZLM4 is able to slot into any already networked perimeter patrol system.